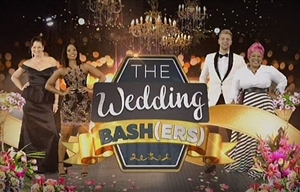 The Wedding Bashers is a South African reality competition television series created by Gavin Wratten in which couples open their wedding days to critique from a team of celebrity "experts", who rate each wedding according to various criteria. The dress should be to die for, the food should be world class, the décor divine and the entertainment a blast, but what happens when South Africans of all backgrounds, cultures and religions open up their special days to The Wedding Bashers? The series turns a microscope onto unique weddings through a celebrity team of "experts" in various fields. In the first season these were former Miss South Africa and businesswoman Cindy Nell, socialite and Vuzu presenter Denise Zimba, celebrity chef and food expert Siba Mtongana and wedding planner Zavion Kotze. Zimba and Kotze returned for the four standalone episodes The Wedding Bashers Specials: With Love, as well as for Season 2 of the main series. They were joined by new "Bashers" Zola Nene - South African celebrity chef and author - and former Miss South Africa Bernelee Daniell. Each week, these four Wedding Bashers make their way to nuptial celebrations across the country, where they join in the festivities and discreetly rate the Big Day. While The Wedding Bashers may disagree about the finer details concerning the fashion and beauty, food, décor and entertainment, their final overall score for the wedding is vital, because at the end of the series the newlyweds at the top of the list win prizes. The weddings featured in the show vary in budget, opulence and theme and are set in a variety of locations including a beach, a vineyard, an industrial chic area and a five-star train. The Wedding Bashers is an M-Net Original Production produced by [sic] Entertainment. The Wedding Bashers 2 starts on Vuzu, IDx freezes in The Dead of Winter and eReality laughs at weird animal faces. Local reality series The Wedding Bashers gets a run on Vuzu, M-Net has a new comedy and Discovery debuts a new vintage car series.